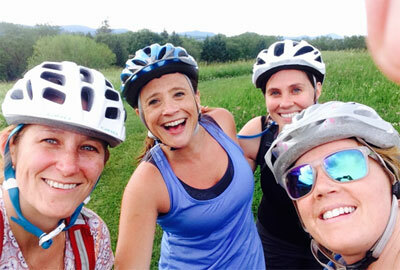 With over 100 miles of interconnected trails, Kingdom Trails in East Burke offers something for everyone interested in mountain biking, cross country skiing and fat biking. The trails feature everything from fast fun flowing singletrack to freeride and downhill trails that wind through a wooded and pastoral setting. The system has traisl for all levels and abilities, whether it's the old cart roads and doubletrack for beginners, or tight, fast, flowing singletrack for riders of all abilities.. The Kingdom Trails office is just down the road from Trail 2 Wellness, and the trails are practically right outside our door. Ask us how you can combine your love of Kingdom Trails with our fitness and massage offerings to help build a better, healthier, stronger you!